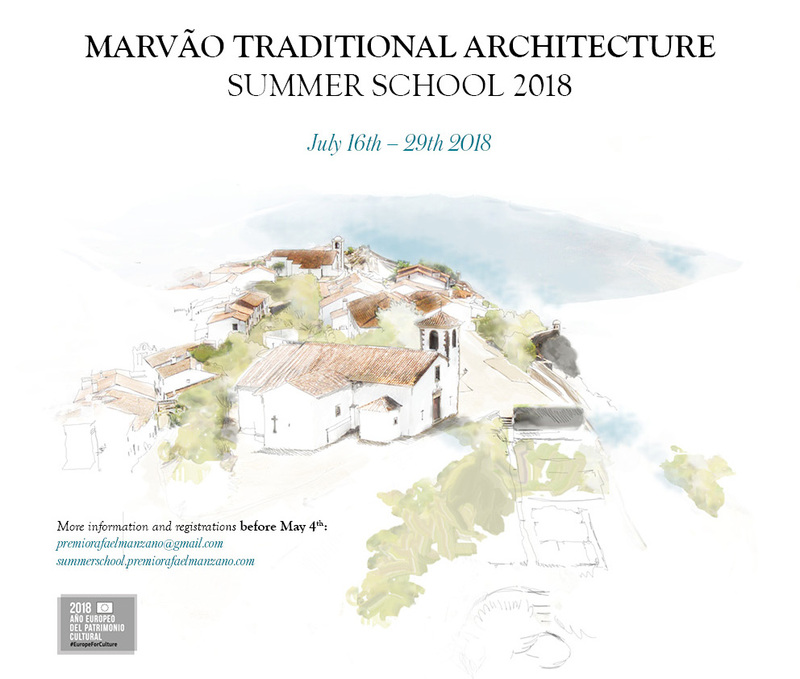 The Marvão Traditional Architecture Summer School is organized by INTBAU and the Rafael Manzano Prize for New Traditional Architecture, thanks to the support of the Richard H. Driehaus Charitable Lead Trust (through a contribution to the Chicago Community Foundation for the Richard H. Driehaus Charitable Fund), the Fundaçao Serra Henriques and Kalam, and the collaboration of the Escola Superior Gallaecia, the Instituto Universitário de Lisboa (ISCTE-IUL) and the Universidade de Évora (Portugal), the Pontifical and Royal University of Santo Tomas (Philippines), the School of Architecture of the Judson University, the School of Architecture of the University of Miami and the School of Architecture of the University of Notre Dame (USA), the Universidad Alfonso X el Sabio, the Universidad de Castilla-La Mancha and the Universidad Politécnica de Madrid (Spain), the Centro de Investigación de Arquitectura Tradicional (CIAT-UPM), the Câmara Municipal de Marvão, the Junta de Freguesia de Beirã and A Anta Association. 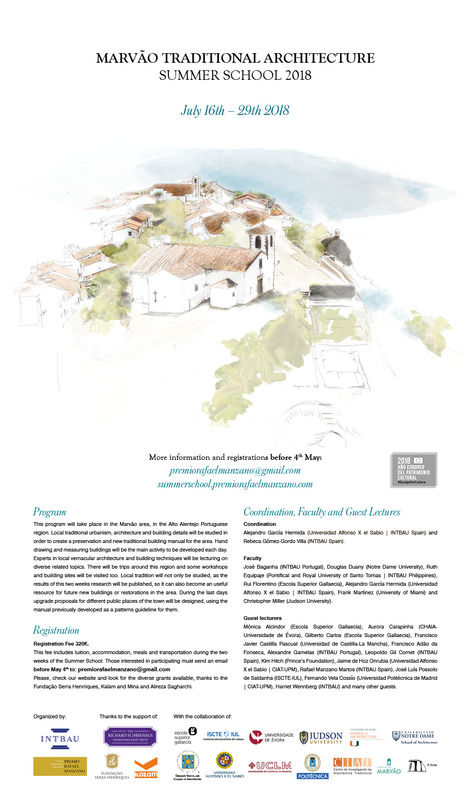 This program will take place in the Marvão area, in the Alto Alentejo Portuguese region. Local traditional urbanism, architecture and building details will be studied in order to create a preservation and new traditional building manual for the area. Hand drawing and measuring buildings will be the main activity to be developed each day. Experts in local vernacular architecture and building techniques will be lecturing on diverse related topics. There will be trips around this region and some workshops and building sites will be visited too. Local tradition will not only be studied, as the results of this two weeks research will be published, so it can also become an useful resource for future new buildings or restorations in the area. During the last days upgrade proposals for different public places of the town will be designed, using the manual previously developed as a patterns guideline for them. The registration fee is €320 and the deadline for application is 4 May. The fee includes tuition, accommodation, meals and transportation during the two weeks of the Summer School (departure from Madrid or Lisbon). We are developing a selection process among all candidates and several places will be reserved for the students of the participating universities. This year eight Portuguese participants can receive a grant covering the fee of the workshop, thanks to the Fundação Serra Henriques, as well as one international student, thanks to Alireza and Mina Sagharchi. In addition, after the workshop, Kalam will offer a contract for at least one year to one participant on the programme. Tutors will include; José Baganha (INTBAU Portugal), Ruth Equipaje (Pontifical and Royal University of Santo Tomas | INTBAU Philippines), Rui Florentino (Escola Superior Gallaecia), Alejandro García Hermida (Universidad Alfonso X el Sabio | INTBAU Spain), Frank Martínez (University of Miami) and Christopher Miller (Judson University), with the collaboration of Rebeca Gómez-Gordo (INTBAU Spain), and the guest lecturers: Francisco Adão da Fonseca, Mónica Alcindor (Escola Superior Gallaecia), Aurora Carapinha (Universidade de Évora), Gilberto Carlos (Escola Superior Gallaecia), Francisco Javier Castilla Pascual (Universidad de Castilla-La Mancha), Javier Cenicacelaya (INTBAU Spain), Alexandre Gamelas (INTBAU Portugal), Leopoldo Gil Cornet (INTBAU Spain), Kim Hitch (The Prince’s Foundation), Jaime de Hoz Onrubia (Universidad Alfonso X el Sabio | CIAT-UPM), Rafael Manzano Martos, José Luís Possolo de Saldanha (ISCTE-IUL), Fernando Vela Cossío (Universidad Politécnica de Madrid | CIAT-UPM), Harriet Wennberg (INTBAU) and many other guests.